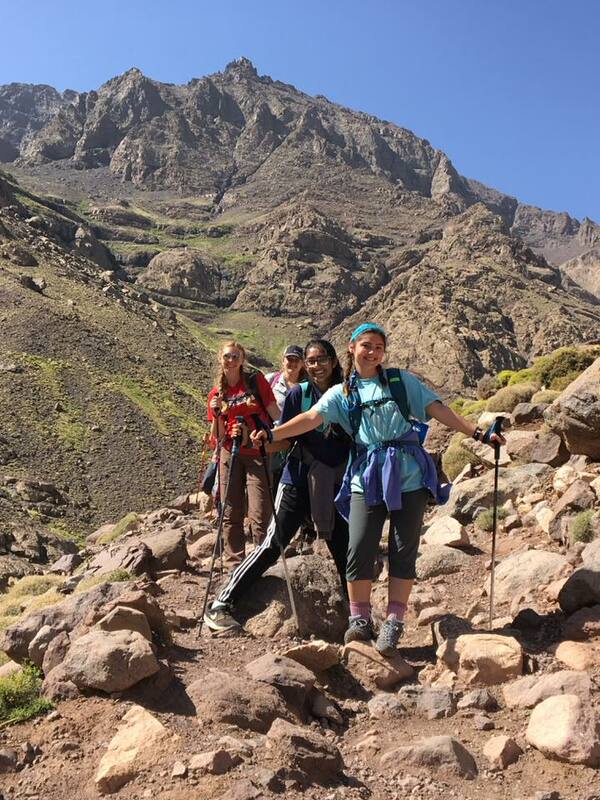 Experience the climb of the highest peak in North Africa, Mount Toubkal summit 4167m (13600fit), get a stunning views of the Atlas Mountains, green valleys & Berber villages, meet the Berber guided & muleteers go for the this adventure of your life time....Mount Toubkal 4167m is the highest peak in North Africa, and is a trekking peak involving no climbing. two days involve walking in crampons holding an ice axe for security (Nov to April ) . 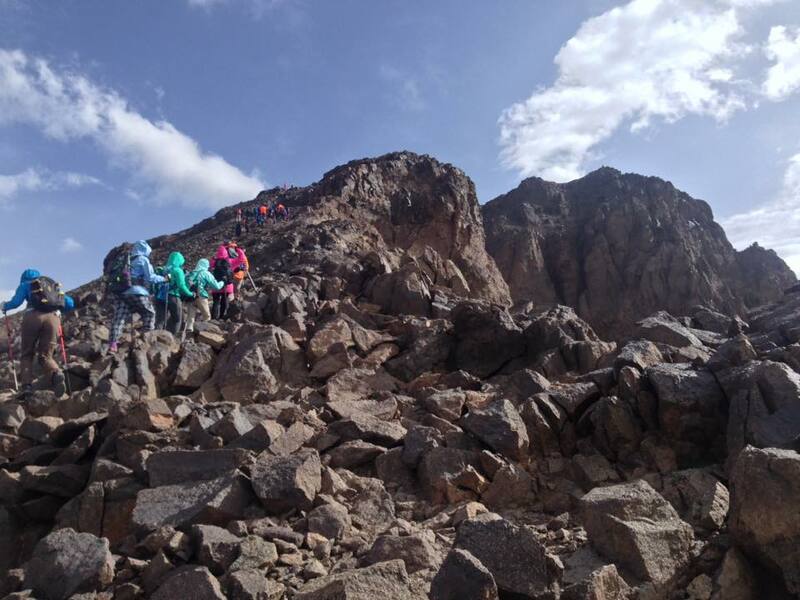 The itinerary has been designed for keen walkers, as the ascent is non-technical, but involves some easy scrambling and snow slopes. 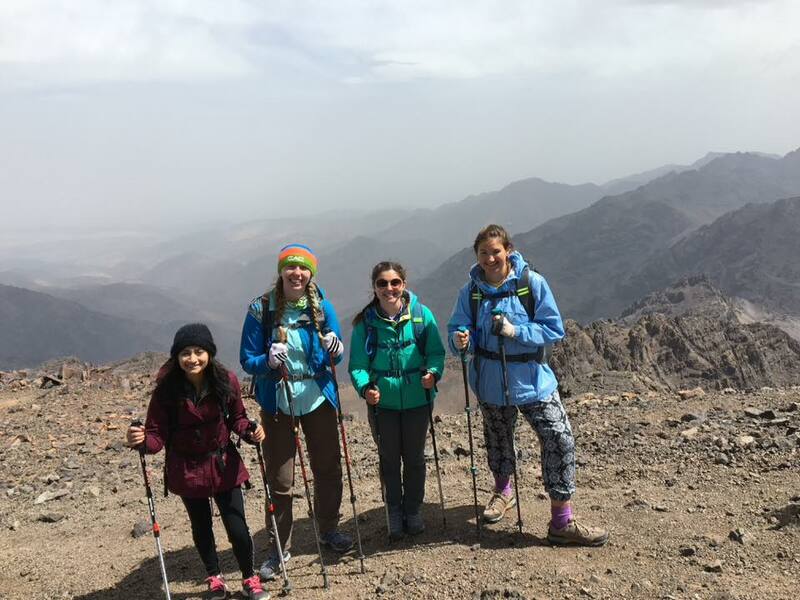 The views from the summit are amazing across the mountains to Marrakech to the north, and the start of the Sahara to the south. All around are the jagged peaks of the High Atlas stretching as far as you can see in every direction. Departure by car from Marrakech around 8h in the morning for 1h20 drive south up the Moulay Brahim Gorges, Asni weekly market every saturday, then to Agersioual (1,600m), set in the upper level foothills of the Western High Atlas mountains, Here you will leave the Vehicle and meet your local guide prior to setting out for some 12km excursion. towards the East to the Berber village of AIkkiss (1,700m), Over Tizi n agersioual pass (2200m). Lunch taken inside a Berber Home (or by the river) then carry on walking up the Imnane valley then over Tizi n Tamter pass (2779m) , From here one can view the two valleys, down into the Imlil Valley and back down to the Imnane valley. 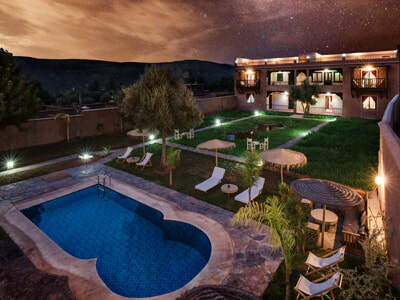 Another 1h30 trek down from here will take you to the village of Imlil where you will enjoy an evening meal in the charming Dar Adrar Guesthouse. 1h20 drive and 6hours walking. snowline and the Toukbal Refuge (3206m), our stop for the night. Approx 5hrs walking. mountains numerous scree fields, where we will have to negotiable a seemingly endless carpet of boulders and rocks. 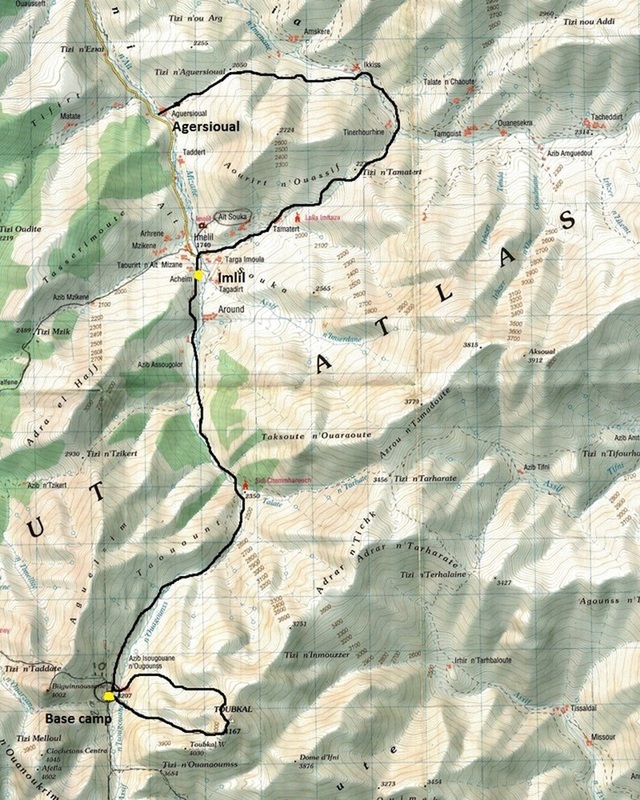 The walking is relatively straightforward, but the scree and the altitude will make the going quite difficult in parts, however, the views along the way make the journey more than worthwhile. Cresting the ridgeline we find ourselves on the plateau, from where it is a short walk to the summit and the vistas out across the surrounding landscape are quite breathtaking. 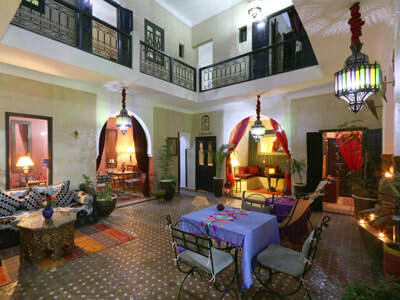 From here there are unrestricted views in every direction, from the Marrakesh Plain to the High Atlas in the north and as far south as the Anti-Atlas and the Sahara. 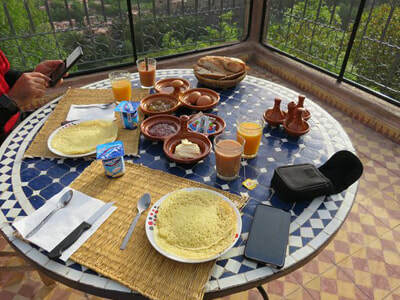 Pliny, the great Roman scholar, once described the High Atlas Mountains as "the most fabulous mountains in all of Africa" and from our vantage point high above the valley it is easy to understand why. Retracing our steps we then return down the mountain and head back towards Imlil Prior To drive back to Marrakech. Mules and muleteers to carry your luggage. 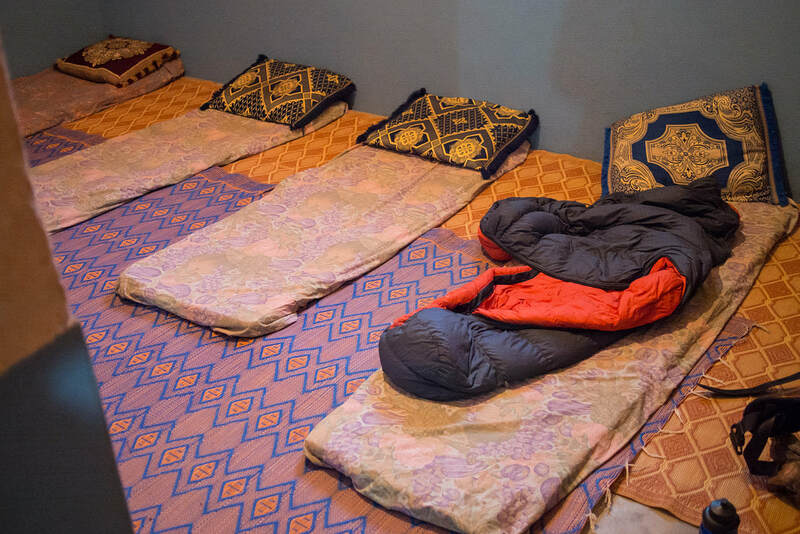 Accommoadtion in a Mountain Hut ( winter) or camping if prefered on summer months. 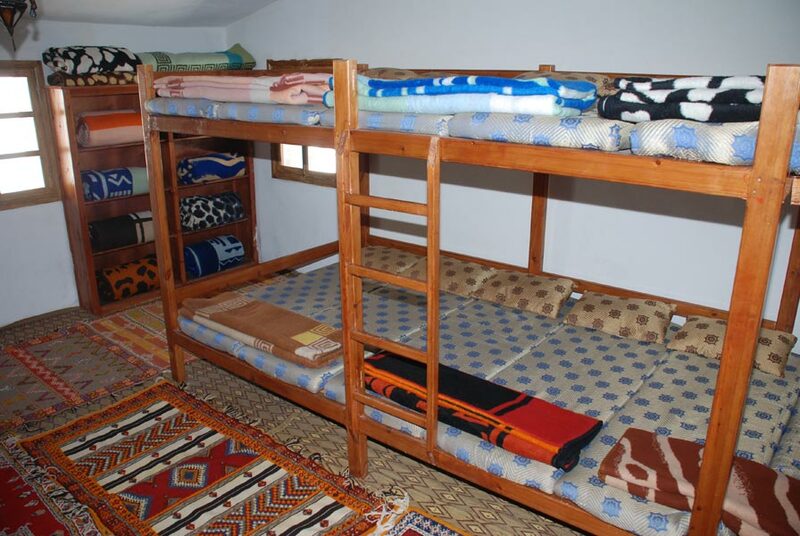 2nd Night : The Accommodation will be in a Dorm at the Mountain hut. I did the above tour on Sunday 20 November. Everything about the tour was first class. Booking was really easy and all my e-mails with questions were answered very promptly. The transfer process from my hotel to Imil was really smooth too with no waiting. I was really impressed with my guide Rashid as he knew the mountain very well and was really friendly. It was great to chat with some of his friends as we walked through his village as well. All the food I had, which was included in the price, was delicious and hearty - exactly what was needed to get to the summit. The tour itself was simply breath taking with all the unfolding scenery as the trek goes on. 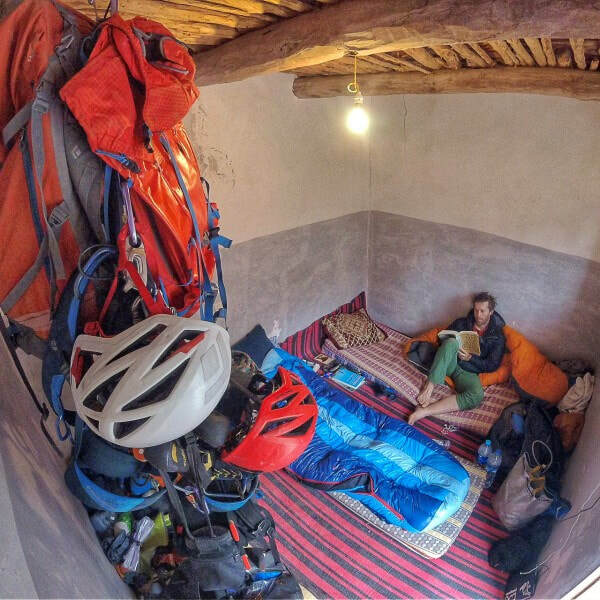 Staying in the mountain hut was good because you can chat with other trekkers and getting to the summit gives a real sense of achievement. I would strongly recommend this tour company to anyone as they were very reliable, friendly and delivered on all their commitments.